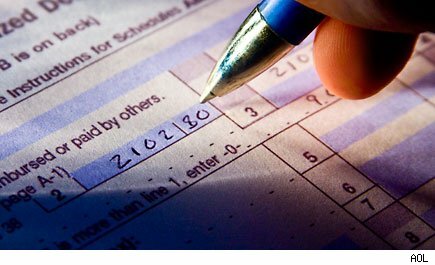 Exemptions are one of the most straightforward parts of the tax code. OK, maybe that isn't saying much, but when it comes to navigating tax season, we take what we can get. And we also love exemptions because they put money back in our pocket. Exemptions work in a similar way as deductions by reducing the amount of income you will be taxed on. For each exemption you take for 2012, you can deduct $3,800 from your gross income to arrive at your taxable income. So if you fall in the 10% tax bracket, that translates to $380 less in taxes. So if you are married with three qualifying children, you can deduct $19,000 in exemptions ($3,800 x 5 = $19,000). Not bad, right? It's a pretty easy portion of your forms to fill out, but-of course-there are some exceptions. Read on to find out more about each exemption and when you can take it. This is the exemption you can take just for being a taxpayer. It's the government's way of saying, "Thanks for being a contributing member of society!" And good news for high earners-previously, once you made a certain amount (around $165,000 to $200,000) you wouldn't be able to take the full personal exemption, but that rule doesn't apply this year. The Catch: You cannot get a personal exemption if anyone else is able to claim you as a dependent. The emphasis here is on the able. Even if they don't take the exemption, just the fact that they are able to means you cannot claim it. (And you might want to ask them why they are letting this pass them by!) We explain who can be claimed as a dependent below, so check out that description if you are unsure, but in general, if you are being supported by someone else, you cannot take this exemption. While your spouse is never considered a "dependent," similar rules apply here. If you are filing a joint return, you can claim your spouse for an exemption. Children. If you have any children under 19 living with you, you most likely can take an exemption for each of them. If your child was permanently and totally disabled at anytime of the year, she can always be claimed as your dependent, regardless of age. Your brother, sister, half brother/sister, stepbrother/sister or a descendent (e.g. niece or nephew) of any of them. Relatives. But your kids aren't the only types of dependents you can claim exemptions for. You can also take exemptions for "qualifying relatives." A relative does not have to live with you and there is no age requirement in order to qualify, you just need to be supporting them. Have received more than half of their support from you, in the form of food, clothing, shelter, education, medical and dental care, recreation and transportation. To figure out whether the relative meets this test, add up all the support they got during the year (including support from the state like welfare and food stamps) and compare what you contributed to see if it is more than half. Cousins do not count. And aunts, uncles, nephews and nieces only count if they are related to you by blood. For example, your husband's sister's daughter does not count if you are married filing separately, but your sister's daughter does. However, the relationship need be present to only one of the two married persons who file a joint return. That means if you are married filing jointly, you can claim your husband's sister's daughter. Will You Get Hit With the Dreaded Alternative Minimum Tax?